Block board is manufactured using longitudinal strips of solid timber making up the core which are bonded together with moisture resistant glue and overlaid with outer veneers. 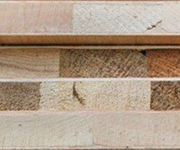 Higher-grade decorative veneer blockboard with finishes such as Oak, Ash etc. are available to order. Block boards of this type might be chosen for furniture making where a wood grained appearance is required. These veneered block boards may be finished with a clear polish for a natural look or tinted with a coloured wood stain before sealing. The decorative grade blockboards are not as popular as they used to be and are therefore not held in stock. Avon Plywood can supply them to order with a lead-time of usually just a few working days but subject to availability. Please enquire for details.